The council is committed to increasing the amount of Cycle Parking available to use in and around the city. Cycle parking facilities are installed on either the footway or the highway depending on availability of space. 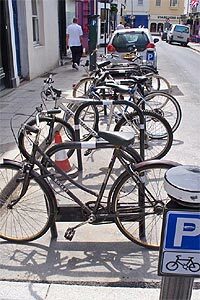 Where cycle parking is installed on the road they are referred to as Pedal Cycle Parking Places (PCPPs). You can find more information on cycle parking and other cycle facilities on our cycle map. If you would like your street to be considered for a pedal cycling parking place, you can submit a request for cycle parking form. You can also contact transport.projects@brighton-hove.gov.uk. If you would like to learn more about cycling in the city please visit our website www.brighton-hove.gov.uk/cycling. For information on cycle training and maintenance training please visit www.brighton-hove.gov.uk/cycletraining.